And you can’t miss Stratman as he rolls into your town. 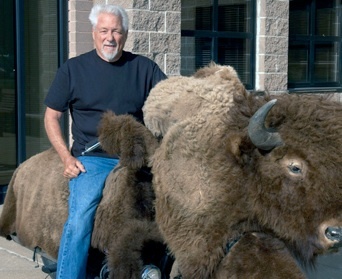 He brandishes a buffalo head on the front of his motorcycle and a pair of horns on his helmet. – “Harley T-shirt: A Rider’s Road Map” View this article in its entirety on our press page. Ron Stratman began miles away from a successful business and a motorcycle adorning a buffalo head that is known to riders across America. As a young teen, Ron became determined to have a motorcycle. Once he earned enough money, he purchased his first, and it certainly would not be his last. Ron had begun racing and at the same time had a growing family. Eventually his son, Carl, began racing and it became a family affair. His wife and daughters tagged along selling iron-on patches and decals to support the racing habit. The family’s weekend venture has now turned into a successful business that to this day fully owned and operated by Ron and his family. Today Ron spends his time consulting on designs, working with salesmen and traveling to visit dealers who have become long time friends. Of course, whenever possible he travels by motorcycle.